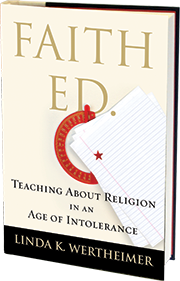 Stay up to date on events, articles, and news regarding Linda’s book, FAITH ED: Teaching about Religion in an Age of Intolerance. Prayer led by teachers was booted out of public schools, but instruction about religion was not. FAITH ED gives a look at the newest debate over religion in public schools – how to teach children about the world’s religions and the best age to begin. Sign up for her newsletter below.